What are design and application of air dryers on board of gas carriers? May 19, 2017, 11:54 p.m.
Air dryers are used in conjunction with a cargo compressor to reduce the dew-point of the atmosphere in the cargo tanks when they are filled with air after they have been gas-freed and before they have been inerted, by withdrawing air from the top of the tank. The air is discharged through the dryer and returned to the bottom of the tank. The dryer is Freon-cooled and is similar to a cargo condenser, the liquid Freon evaporating inside the tubes in the dryer. 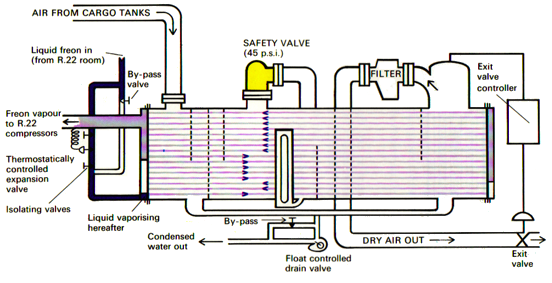 The admission of liquid Freon is controlled by a thermostatically-regulated expansion valve, the sensing bulb of which is in the vapour outlet pipe. By reducing the temperature of the air passing through the dryer, the water vapour content is precipitated, the rate and degree of precipitation being increased by maintaining a pressure of 1.8 bars whilst the temperature is reduced to +2° C. A float-operated valve drains away the condensed water from the bottom of the dryer, the dried air leaving it from the top, passing through a meshed filter. The pressure in the dryer is maintained by a pressure sensitive exit valve. May 20, 2017, 12:01 a.m.
Tanker vessel accommodation ventilation system preparations for cargo operations.